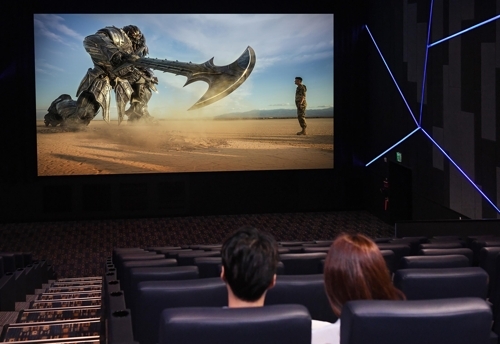 SEOUL, July 13 (Yonhap) — Samsung Electronics Co. on Thursday introduced the world’s first LED theater solution, which boasts far improved display resolution compared to traditional movie screens. Under cooperation with Lotte Cinema, a major movie chain in South Korea, Samsung said it successfully installed the cinema LED screen. “Based on Samsung’s display technology, we commercialized the cinema LED screen that does not need projectors for the first time in the world,” said Kim Hyun-suk, who heads Samsung’s display business. The cinema LED supports High Dynamic Range technology that allows the screens to deliver vivid displays by optimizing brightness. Samsung said it also utilized the audio system by Harman International Industries, which was earlier acquired by the South Korean giant. The company said audiences will be able to enjoy high-resolution movies through the screen which will boast improved resolution compared to traditional movie screens. Samsung Electronics said it has been joining ties with global film brands including Fox and Universal Studio to develop movie content with HDR technology.